Reviews for Weed A Way Ltd. Hired this company for a service at our office building and have been very happy with the overall outcome the lawn really got into shape around the middle of the season and continued on into the fall. We just recieved our first application of the year yesterday and the tech was more then pleasant as he was the gentlemen who came out last year and did the grass. Thanks for your review we appreciate the time you spent reviewing our company we are glad that the services were up to par. From all of us at Weed Away thank you. Thank you for looking after our property as we spend a lot of time up in Huntsville during the summer we are pleased to know our home is being cared for and we are keeping up with the neighborhood green thumb as my hubby calls. Lawn looked amazing last year even our landscaper who cuts the yard said he can’t keep up with cutting the grass because it was growing so much, we had quite the laugh over it. Your fertilizer certainly works wonders. Grass is green weeds are gone that’s why I hired you guys keep up the good work! We are going to continue with the service and look forward to seeing you guys. Thanks for all your great work! I was referred by a co-worker to try weed away lawncare as I was not very happy with my current provider, so I decided to switch based on what I heard. There are a lot of companies out there so I wasn’t really looking forward to hoping to find a company that can simply just look after the grass and take that worry away from me. Signed up and have not had any issues I’m actually quite happy with the transition and I would feel comfortable recommending these guys to others. Thanks for your review we appreciate hearing your feed back! We have been a happy customer for the last 3 years with weed away. They make sure to visit the property on scheduled visits and call the night before they come out so that I can clear out my yard and get it ready for them. We are going to continue with the service for this year again and look forward to seeing you guys. I have multiple rental properties that I have weed away look after so that my tenants are happy. My house we do the premium program and the grass looks amazing and on the rental properties we have gone with the basic program to keep the grass green and minimal weeds which I have not had any issues with as my tenants are happy with the lawn as well. We appreciate you trusting us with your rental properties as well as your home thank you for your review. 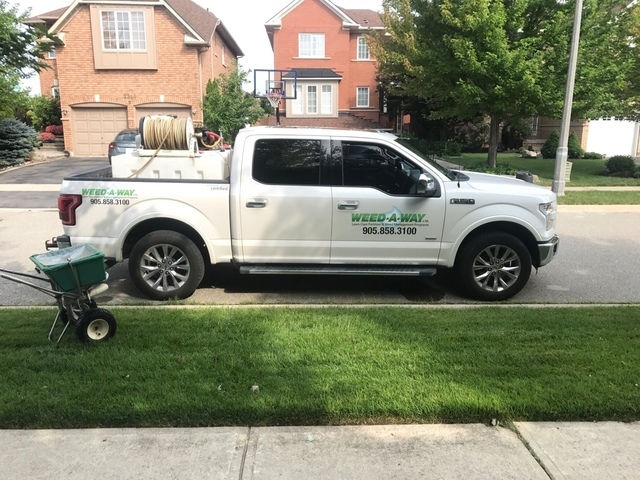 More about Weed A Way Ltd.
Weed-A-Way is one of Canada's largest independent, family-owned and operated green lawn care companies. 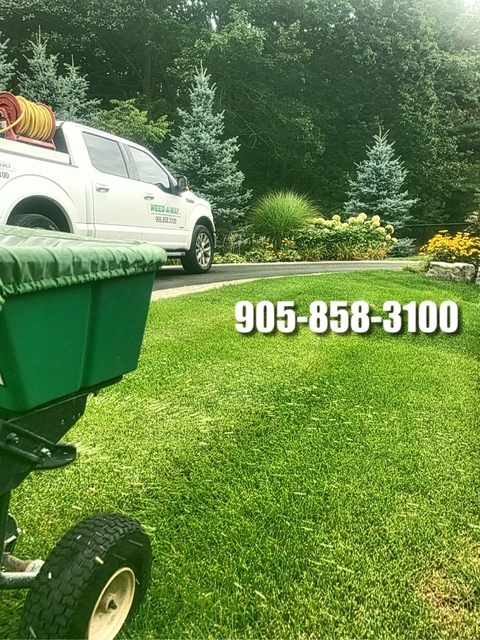 For over 4 decades our professional lawn care and weed control services have served customers in Mississauga, Brampton, Oakville, Burlington, Milton, Georgetown, and Caledon. Keeping a lawn vibrant, lush green, free of weeds, safe from insects and pests, is a shared responsibility between our professional staff and the home owner whose lawn we care for. A responsibility that we take very seriously and are deeply committed to. Download our Lawn Care Tips to stay on top of lawn maintenance. 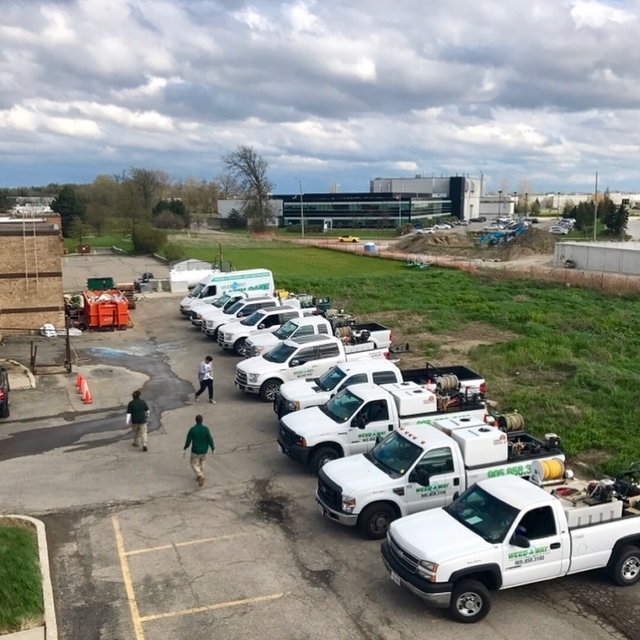 *As industry leaders and certified IPM (Integrated Pest Management) specialists, our lawn care programs utilize the most advanced turf management practices and products. *Our lawn amendment treatments as well as lawn care programs promote a vibrant landscape. *Depending upon weather conditions, we use a combination of Liquid and Granular fertilizers. Of course, if you prefer Granular, just let us know. *We guarantee results with our fertilizer and weed control programs. If after an application stubborn weed persists we'll come back and re-spray at no charge. *Weed Control: FIESTA: A highly-recommended timely weed control which is composed of iron and is odourless, Fiesta kills the weeds but does not harm the lawn. It is applied by our highly qualified technicians throughout your season long program. Weeds compete with grass and plants for nutrients, water and sunlight. Broadleaf weeds are usually the greatest threat. If not dealt with quickly, they can destroy all your hard work. Effective weed control solutions from Weed-A-Way lawn services will ensure a healthy and vibrant lawn. We have extensive experience in dealing with various types of weeds like dandelion, broadleaf plantain, etc., and know how to deal with each one. 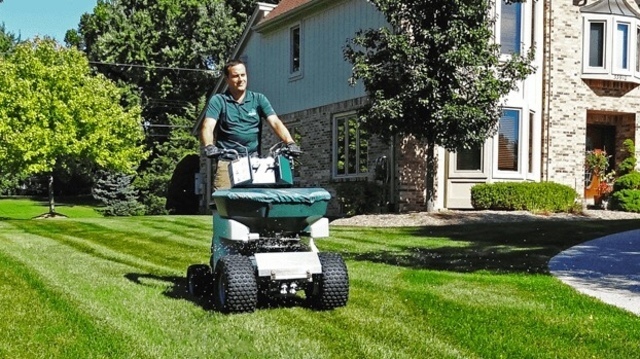 *Core Aeration: The secret to a lush, green lawn is core aeration. Soil compacts over time and especially with traffic. Core aeration allows nutrients, water and oxygen to reach grass roots more easily. However, lawn aeration is more than just punching holes in the ground. You must have the proper equipment and be willing to set aside a couple of hours for aeration. It’s also important to know when your garden needs core aeration. 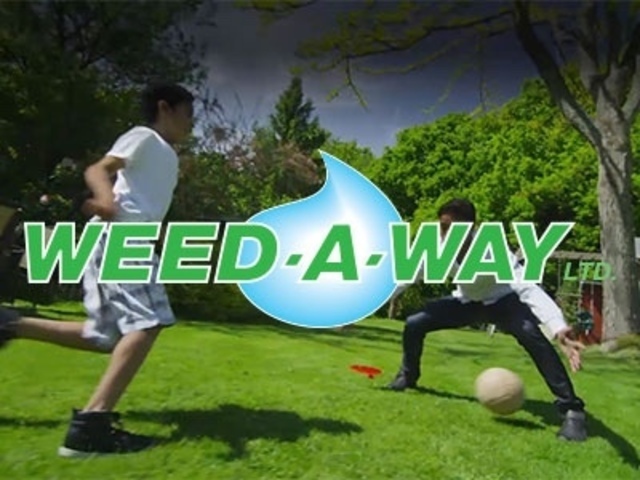 Weed-A-Way’s lawn services take the trial and error out of grass treatments. We make sure that the grass is always green on your side of the fence. *Grub Treatment: Typically, grubs attack grass roots. A damaged root system results in a poor quality lawn with dirty, yellowish brown patches. 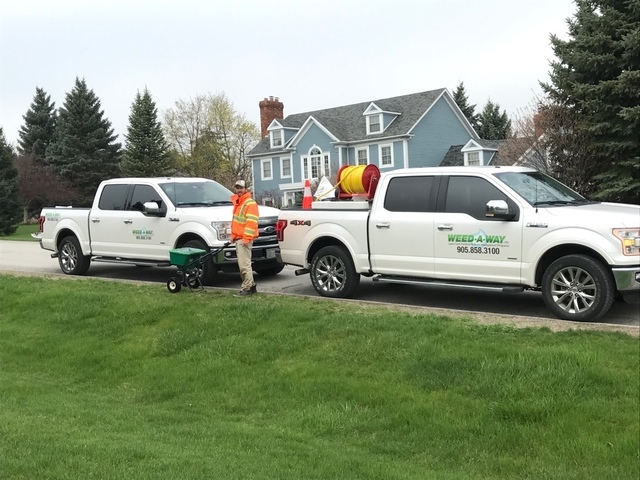 Timely grub treatment from Weed-A-Way will avoid the huge expense of replacing your lawn as well as eliminate the threat of skunks and raccoons that feed on them. By using natural grub treatments like nematodes (naturally occurring microscopic worms) to destroy them and alfalfa treatments to stimulate roots, increase growth and drought resistance, our efficient lawn services will ensure a strong and healthy turf. *Crab Grass Control: Crabgrass forms thick clumps of light green leaves that are highly competitive with turf grasses. It turns brownish red in mid to late summer. Timely treatments are the most effective way to deal with crabgrass. Since this lawn problem germinates from seeds in spring it’s extremely important to apply the crabgrass control treatment before germination takes place. *Lime Treatment: In order to have healthy soil that supports grass growth, it is important to maintain the appropriate pH (acidity) balance. Using lime treatment is often the best solution. Although some lawn experts recommend lime treatment before starting a lawn, applications on mature turf also have several benefits. However, in order for your lime treatment to be effective, you must have knowledge of your soil’s pH levels. Our experienced lawn services will analyze a soil sample before applying lime treatment to your grass. We make sure we get it done right. *Surface Insect Control: Chinch bugs, sod webworms, cutworms and other surface insects usually strike in the summer. They are so small and usually buried in the lawn thatch; that’s why it so hard to spot them. Very often insect ridden grass looks dry and you might think it simply needs watering. Since your lawn is already stressed with the heat, drought-like conditions, weeds and traffic, the damage is greater. Weed-A-Way surface insect treatment means identifying your problems quickly and correctly, and then taking the appropriate control measures to eliminate the pests. *Overseeding and Core Aeration: Core aeration makes your overseeding efforts worthwhile. By unplugging the soil in a methodical way, you can remove thatch and reduce soil compaction as well as increase success of weed, surface insect and lime treatments. But a significant benefit of core aeration with regard to overseeding is that it allows the nutrients to reach the seeds and roots faster. Our expert lawn services can handle your overseeding and core aeration requirements to ensure proper effectiveness.